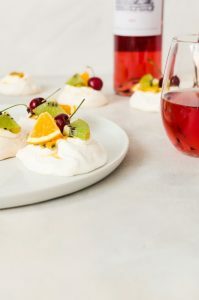 Mini pavlova small enough to enjoy standing up with a glass of rose. Preheat your oven to 350 degrees. Line two baking sheets with parchment paper. Thoroughly wash your mixing bowl and whisk attachment. Rub down with lemon juice to help remove any oily residue. Add your egg whites to the bowl and beat until they are very foamy. About 3 - 5 minutes. Add the salt, cornstarch, and cream of tartar. Continue to beat on medium-high until soft peaks begin to form. Slowly add the granulated sugar and beat until stiff peaks form - about 8 to 10 minutes. Fold in the vanilla. Spoon or pipe the meringue in small rounds onto the baking sheet. Use the back of a spoon to make holes in the meringue so they look like nests. Add the baking sheets to the oven and turn down the heat to 250 degrees and bake for 90 minutes. Turn off the heat, but to not open the oven. Allow to sit for about 3 hours. Crack open the oven door and leave cracked open for about 20 minutes. While the nests are in the oven, whip heavy whipping cream and powdered sugar together until it forms soft peaks. Set aside. Remove the nests from the oven and top with the whipped cream and fruit. Serve immediately.